German auction house Team Breker, which specializes in technical antiques, notes the Apple-1 is being sold by its original owner, an unidentified computer engineer from Berkeley, California. Said to be the "best-preserved example of an Apple-1 computer to have appeared on the market," The Telegraph reports it to be in full working condition, and is believed to be one of only eight remaining working units left in existence. A spokesperson for the auctioneer advises it is 14th on Mike Willegal's Apple-1 registry, with serial number 01-0073, and also bears the original NTI sign. The documents accompanying the Apple-1 include the original manual, complete with the primary logo, circuit diagrams, and a receipt for the motherboard and cassette interface. An original letter from Apple customer care is also provided, advising the customer could not upgrade to the Apple-II. Aside from original documentation, the paperwork also includes a collection of notes from telephone calls with Apple co-founders Steve Jobs and Steve Wozniak in 1977. 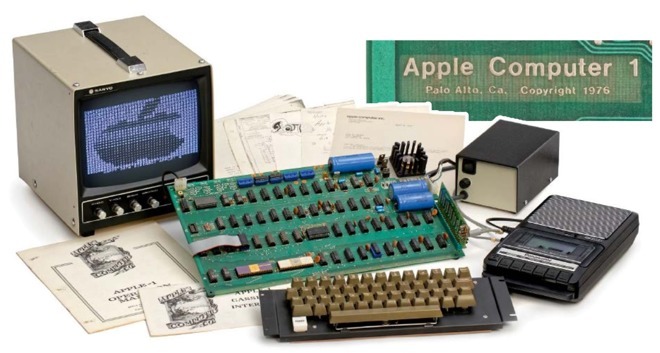 Going on sale in Cologne, Germany on May 20, the Apple-1 is estimated to sell for between $190,000 and $320,000. Given previous auctions for the Apple-1, and the state of preservation, it is likely the final price will be far higher. Last year, a "Celebration" motherboard believed to be one of the first hand-built prototypes for the Apple-1 sold for $815,000. In 2014, a working Apple-1 was auctioned for $365,000, falling short of estimates between $400,000 and $600,000, while a 2013 auction for an Apple-1 signed by Steve Wozniak fetched $671,000. The current record for the highest price paid at auction for an Apple-1 is $905,000, acquired by The Henry Ford organization in late 2014.